Ambassador Richard Court speaks to The Japan News at the Australian Embassy in Minato Ward, Tokyo. The Japan News Japan and Australia, enemies during World War II, have successfully developed a close and mature relationship. Charles Court, premier of the state of Western Australia from 1974 to 1982, spearheaded the state’s export of iron ore to Japan. His son, Richard Court, elevated the Japan-Australia relationship to a higher level as a premier of the same state from 1993 to 2001. Richard Court, who is currently serving as Australian ambassador to Japan, spoke with The Japan News about his family’s ties to Japan and the future of the nations’ relationship. 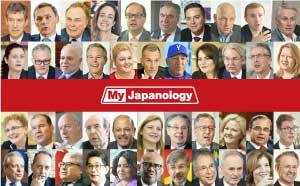 The Japan News: How did you come to know Japan for the first time? Richard Court: My first physical visit to Japan was in the early 1980s, but my association with Japanese people goes back to the late 1950s. My father became a minister in [Western Australia’s] government in 1959. In the early 1960s, there were a lot of Japanese businesspeople visiting Western Australia when they were negotiating the first iron ore agreements with Western Australia supplying iron ore to the Japanese steel mills. My father’s connection goes back to World War II. Because he was in the army, he was in Bougainville in Papua New Guinea. At the end of the war he had dealings there with a number of the Japanese officers. With two officers that he was negotiating with in 1945, he became good friends in the 1960s, because my father was visiting Japan during the negotiations with the Japanese steel mills. When I became a member of Parliament [in Western Australia] in the early 1980s, I came to Tokyo and met the same Japanese [former] officers. I was not aware of their backgrounds until I met these people, but they told me the story. So, in the early 1960s, I was just a teenager, and there were a lot of Japanese businesspeople visiting our home as a part of the negotiations that were taking place. I became quite used to being amongst those Japanese businesspeople. When I entered politics, I started to build up my own personal connections, both visiting Japan but also working with the Japanese companies, getting an understanding of the Japanese companies in Australia. Ambassador Richard Court speaks during an interview. Q: What was discussed between your father and the Japanese businessmen at the time? A: Two main things. The first thing they were negotiating was the iron ore agreements. And then, they had put in place the next negotiations regarding liquefied natural gas. My father’s government had to underwrite the North West Shelf Project by committing to building a gas pipeline and taking domestic gas in Western Australia. That led to the first exports of LNG out of Australia, and Japan was the customer. So, he then built up a good relationship working with the Japanese utilities. Q: What were your father’s sentiments toward the Japanese? His first encounter was with Japanese prisoners during the war. A: I think it’s a good story for both countries, because it’s a story of forgiveness, of reconciliation, and then building trust and respect. Sixty-plus years later, the relationship between Australia and Japan is incredibly strong. It’s a relationship that is the envy of many countries around the world. I think both countries should be very proud of what they have been able to achieve. To go from fighting each other to build that incredible trust and respect. And it’s been a privilege for me to come into this role, as the Australian ambassador, and to witness firsthand just how significant that trust and respect is. Q: As a premier of Western Australia, you promoted exports of natural resources to Asian countries including Japan. A: Australia is a trading nation. It is critical that you are always looking at expanding the export markets. In my case, my first focus was Japan, which was already a mature market for us, then Korea, and then China. I was involved in a lot of the early negotiations with China as it was starting to begin its rapid economic growth. Q: Now China, not Japan, is the biggest trade partner of Australia. A: I think that the China story has been a good one for Japan and it’s been a good one for Australia. The economic growth of that country has provided so many opportunities for both of our countries to grow. So that’s why it’s become our largest export market. Interestingly, Japan is our second largest source of direct foreign investment. The United States is our biggest foreign investor. Japan is still very important. Q: How significant is the Trans-Pacific Partnership free trade agreement for Australia and Japan? A: It’s very significant. Australia and Japan are both trading nations. We can only grow if access to markets is growing. It’s to the credit of the TPP 11 partners that when the United States pulled out they were prepared to continue what were difficult negotiations. Japan needs to be complimented for taking a leadership role in those negotiations and our negotiating team enjoyed working alongside your team. There’s going to be significant economic benefits flowing for all the parties involved, because it is a very high quality trade agreement. There are two things that have come out of it. One is, just in the negotiations, we all got a better understanding of each other’s countries, cultures, economies and the like. It was a terrific process to make us better informed as to what was happening in those 11 countries. The other interesting thing that’s come out of it is that a number of other countries now want to join. So although we’ve had a lot of publicity about the United States pulling out, a lot of countries want to come into the TPP. So, hopefully over the next few years, there will be new agreements reached where it can be extended. Q: Are you concerned about the trend of protectionism? A: Australia learned the lesson about protectionism the hard way. Protected industries do not survive. To survive, you have to be competitive internationally. When you have high levels of protection, you’re not doing any favors to that industry because they tend to not be innovative. When you’re not forced to face competition, you don’t become efficient. So any country that moves toward more protectionism is doing itself a disfavor in the long term. Q: It seems that growing Chinese influence in Australian politics has become a great concern recently. A: China has become a very important market for not just Australia but for Japan and many other countries. And the relationship that Australia has with China is a very good relationship, it’s a strong relationship. We’ve made it clear not just to the Chinese but to any other country, don’t try and interfere in our domestic politics, that’s our business. We’re quite capable of doing that the hard way ourselves. But the relationship is a strong one. Are there growing pains? There’s a few. And that’s to be expected when there’s so much change occurring within the respective countries. To me, it’s been a very good journey, and I’ve been a part of it from the beginning. As I mentioned, in the 1990s I was actively involved in promoting our trade and investment with China, and my dealings with the Chinese government were always excellent. When a country is growing so quickly and things are changing so quickly, there will be pressure points. But our relationship is strong enough to work our way through those. Q: China’s naval activities in the South China Sea, and even the Pacific, have also become concerns for Australia. How do you see these? A: The concept of freedom of navigation through these waters is just critical for us. Our major trading partners are Japan, South Korea, China, and our future trading partners are going to be across the Indo-Pacific region: From Africa, across the Middle East, India, the ASEAN countries, to North Asia. So, freedom of navigation is absolutely critical. That sort of issue is not negotiable. Q: Is there a common perception among the Australian people that the U.S. power that has been dominant in the Indo-Pacific since World War II has been declining? A: No, it’s not. Australia and the United States are incredibly strong allies, and the United States is the largest investor in Australia. It’s a very good relationship. We also know that the United States sees the region, the whole Indo-Pacific region, as very important. From a defense and strategic point of view, everyone in that region has benefited from the role that the United States has played over the last 60-plus years. There’s been a level of stability across the region that has enabled countries like South Korea, Japan and China to be so successful. I think we should be very appreciative of the role that the United States has played, is playing and will continue to play for many, many decades to come. Q: Is the North Korean issue a serious one for Australia, which is far away from East Asia? A: It is, because we all want to live in an orderly world that’s prepared to live under international rules. When you have a wayward state starting to threaten with nuclear weapons and the like, everyone should be concerned. The Australian position is the same as Japan, same as the United States — we want to see the denuclearization of the peninsula, we want clear evidence that that is happening. We need the proper sort of inspection mechanisms in place, and the end result would be certainly a win-win for all involved, including North Korea, if that threat was taken away. The last thing we want to see is the threat of nuclear weapons being used. Living in Japan, I can understand the incredible sensitivity on this matter. Q: What kind of role does Australia want to play in the international community? A: We have always been prepared to take responsibility, when the rule of order is under threat, when weaker countries are under threat. We support the democracies in the region. Although we are a country with a relatively small population, we have never shied away from being prepared to help keep stability in the region. Q: What kind of relationship does Australia need to forge with Japan? A: Our relationship is already incredibly close. We have a special strategic partnership. Our Prime Minister [Malcolm] Turnbull has a very good working relationship with Prime Minister [Shinzo] Abe. We have great respect for what Prime Minister Abe has done for this country. He has restored a level of confidence and optimism in this country, and I think that’s something Japan can be very proud of. Japan now plays a very important role with the way it handles diplomacy in the region, and it does it with that level of confidence. The important thing for Australia is not to become complacent. The relationship has never been stronger, but it still has to be worked on. And we have done very well on the economic and trade issues. We are building up a closer relationship on defense and strategic issues. I think the area where we’ve got a lot of opportunity to grow will be Australian companies and Japanese companies together working to take advantage of opportunities in third countries. In areas where we have expertise, like energy, for example, I would like to see Australian companies working more with Japanese companies to develop logistics chains across the Indo-Pacific region, and hopefully we would benefit by also being able to supply resources into those logistics chains. The region is looking very good, I am very optimistic about the outlook of what’s going to happen in India and Indonesia and the like. Between Australia and Japan there’s still a lot of growth ahead for us to take advantage of. 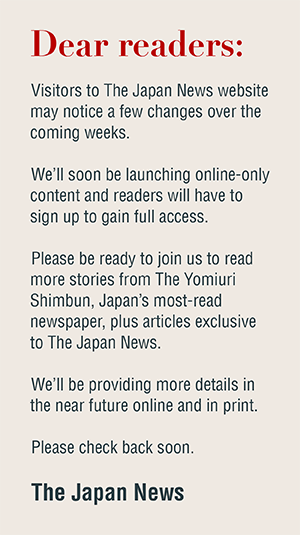 Q: Your embassy has recently started a new campaign called “Australia Now” in Japan. A: Every year the Australian government chooses to showcase Australia to another country. Last year it was Germany, and this year it is Japan. It really is wonderful for us because this year we’ve got over 40 different events coming here. We’ve got cultural events, we’ve got science, we’ve got architecture, engineering, we’ve got all these different events showcasing what we can do in Australia. It fits in beautifully because we are doing that promotion this year, then next year it’s all the Rugby World Cup and Australia will be heavily involved in that. And then the year after that it’s the Olympics, so we’ve got sort of three years of promotions. It also explains how we are addressing some of the social issues — people with disabilities, the aging population and indigenous communities. This interview was conducted by Japan News Deputy Editor Susumu Arai. Richard Court was born in Western Australia in September 1947 and graduated from the University of Western Australia. He was elected to the legislative assembly of Western Australia in 1982, and served as premier and treasurer of the state from 1993 to 2001. He received Japan’s Order of the Rising Sun, Gold and Silver Star in 2008 for his contributions to the expansion of Japan-Australia relations, among others. He presented credentials to the Emperor in April 2017.